Puritan and Company, Inman Sq. I was so excited to go to Puritan and Company, Will Gilson’s new restaurant in Inman Sq. I’ve been a fan of his ever since I had his homemade tator tots at Garden at the Cellar. I even forced Steve to sit at a large communal table with strangers so that we could dine at Herb Lyceum, the restaurant at his family’s farm in Gorton. We arrived on time for our 7pm reservation, but our table wasn’t ready and the bar was packed, so we milled near the entrance, shivering every time a blast of cold air hit us from the door. 15 minutes later, the host informed us that the banquette we were slated for was still occupied, but they could offer us two seats at the back “Chef’s Table.” area. It’s a small U shaped bar that seats 10, surrounding the garde manger station, where cold dishes (such as salads, hors d'œuvres, appetizers, canapés, pâtés, terrines and desserts) are plated. I was happy to sit there and have the additional theater of food preparation to entertain us. We shared the gougers, warm, savory pastry puff filled with a cheese sauce. I enjoyed them, but Steve wasn’t a fan of the oozing sauce. The menu lists rosemary, but I didn’t detect any. The brioche rolls they brought out were so tender, fluffy and had a perfect hit of salt. I’m not quite sure why when they offered us more, Steve declined. 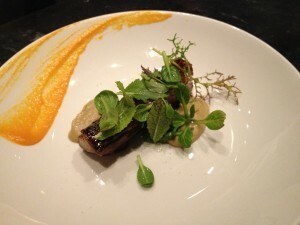 Next we shared the lamb belly appetizer. I thought it was great; smoky, salty, a touch of sweetness from the Moxie soda glaze. Steve didn’t think he would like it, but agreed to try a bite and he acknowledged that it was delicious. The portion was small, but the belly was rich and unctuous, so 3 bites each was satisfying enough. I had a salad for my entrée. 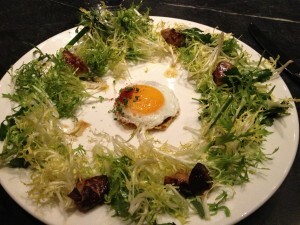 Fear not, loyal reader, it was a frisee salad with foie gras and a sunny side up eggs. The description promised cracklings, but there was none to be found on my plate. I think all salads should come with eggs and foie. Steve ordered the flounder and he was presented with a beautifully plated dish of fish, dotted with spinach sauce, a sunchoke puree and tiny baby onions. He stated that he liked the fish, but the plate was “small,” I agreed; it was very precious looking. Our service was thoughtful. The food was coming out slowly and our server and a manager came over to apologize and to let us now it would be there soon. I didn’t mind the wait, as I enjoyed watching the chefs plate various dishes and desserts. 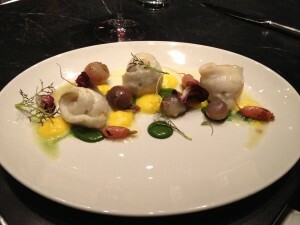 They seem really in to the “smear” presentation, as it seemed all the plates were “painted” with a sauce or a puree. 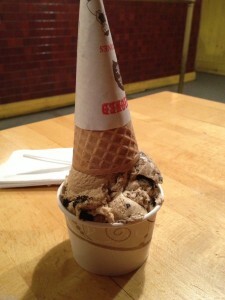 We decided to forgo dessert for a stroll up the block to Christina’s for some ice cream.